That was until the message showed up one day last week and in my haste to delete it, I mistakenly pushed the wrong button and launched the order process. And erased my DVR library of saved shows. Frustrated and upset, I gave in and reluctantly completed the order. Within two days, a big box magically appeared on my front steps just as our handyman, Larry, came to visit. He had the equipment working within fifteen minutes. (Ok, I imagine I might sound like a dinosaur to some of you who have been using this technology for a while ). After finding favorite shows within seconds and setting up new recordings, I shut the TV off and sat in the living room, thinking about the symbolism of this experience. This wasn’t just a cable equipment issue, it was about my resistance to change. I thought about how I had labored over whether or not to try Facebook Live because I assumed it would be too complicated and, when I finally did use it, discovered it was a wonderful new way to connect with my online community. It’s so easy to want to maintain status quo given how quickly technology is changing our lives. I still remember eight-track tapes, don’t you? But this week I realized how beneficial and important it is to upgrade my inner technology so I can embrace change with open arms (or at least an open mind ). 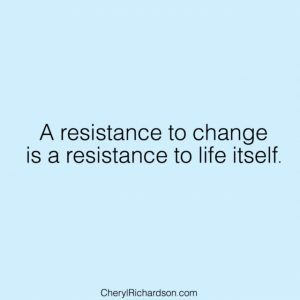 A resistance to change is a resistance to life itself. Where else might you make things easier by embracing change, too? Here’s a beautiful, empowering message for International Women’s Day. This is a must-watch video. You can see it, here. Thanks, Nanna !